You pray for your brother's wealth and luck all the time. It's now time when your prayers for your brother should reflect in your tokens of affection. On the auspicious occasion of Rakshabandhan, order a luminous and precious Pearl Rakhi online for your doting brother from FlowerAura and give words to all your prayers. Pearls have often been referred to as the ‘teardrops of the moon’. With time, they have come to symbolise purity and innocence. That is why, everyone has an innate fondness for pearls. Well, it stands to reason that pearls should be a part of all occasions and celebrations. And with Rakhi coming up, how about surprising your brother with a pearl Rakhi? 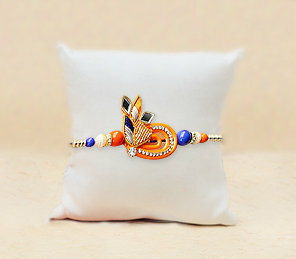 Undoubtedly, your brother would fill with immense joy and pride when you would tie this auspicious Rakhi on his wrist. If you and your brother are sharing a long distance relationship, you still have an option of sending love to him. FlowerAura operates in 170+ cities. So, if your brother resides in Lucknow, you can send Rakhi gifts to Lucknow to your dear brother and remind him your love for him is still intact. Along with it comes an exciting option of same day delivery so that the magic of the occasion is not lost and you are able to send pearl Rakhi to your bro right on time with free shipping. Where to look for pearl Rakhis online? Well, what better option than the vast collection of Floweraura that has an extensive assortment of Rakhis in all shapes, sizes and patterns? Look for the Rakhi of your favourite choice and send it to your brother across states. He is sure to feel your love and affection in the form of pearl Rakhi that symbolises the purity and innocence of your relationship. Do not give second thoughts while you send pearl Rakhi online or any other city. Floweraura assures an instant delivery so that you could sit at the comfort of your home and enjoy the bond of love with your brother in the most pleasant way as the free home delivery is something to add to your ease while you send love across miles. Rakhi is around the corner and your brother deserves nothing other than the best. The traditional event of auspicious and divine Rakhi can be made even more joyful with well-crafted Pearl Rakhi. There are wide ranges of Pearl Rakhis available in Flower Aura, and these are not only beautiful but also decorative and attractive. As per the ancient Hindu Mythology, Pearl is not only beautiful but also significant for prosperity and wellness. The precious Rakhis are designed with precious pearls, semi-precious pearls, and affordable pearls as well. The design of the Rakhi looks astonishingly beautiful when the pearls are tied with the strings. The gorgeous pearls are well polished and crafted for the fortunate Rakshabandhan. Make this Rakshabandhan a memorable one with the gripping design of the Pearl Rakhi from FlowerAura. There isn’t a better choice than a Pearl Rakhi on this Raksha Bandhan in terms of design, uniqueness and cost-effectiveness. Brother is the most precious gift for a sister and the Pearl Rakhi can be the best for this Rakhi. So, glitter the divinity of occasion with the shine of a pearl in this Raksha Bandhan. Whoa! Now the sisters can get geared up for the eve of Raksha bandhan with the impressive and intricately designed pearl rakhis which would surely look wondrous on the wrists of the brothers, even the ones who are stayng away from their sisters in other cities. You can now order the pearl Rakhis online through flower aura and send Rakhi to Mumbai or any other location where your dear brother resides to make him feel soulfully special.